Sunglasses have higher upper edges than prescription glasses. If you're not sure whether this size will cover your glasses perfectly, it is recommended that you should choose a bigger size. Which could improve your vision and sharpen your eye sight. -Absorbing over 99%of harmful UVA&UVB spectrums. -The clip is forged by premium metal material and with rubber cover on each leg. -Provides you a durable, sturdy and protective product . 【Product Parameters】lens wide:59mm; lens height:41mm;frame wide:133mm;bridge:15mm. 【UV400 Lens Technology】Absorbing over 99%of harmful UVA&UVB spectrums. 【Clip on Prescription Glasses】 Fits both metal and plastic frames, no need to buy expensive prescription sunglasses. 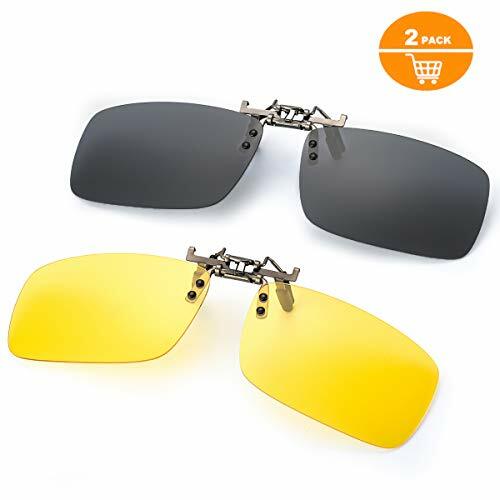 【 Polarized Lenses】 9 Layers Polarized lens improve your vision, reduces glare and reflections all day night, great for driving, and any outdoor activities. 【30 DAYS MONEY BACK GUARANTEE】 Customers can return and get 100% refund in case the purchasing is not satisfactory for any reason. You have no risk to try and we will provide you the best service! If you have any questions about this product by ELIVWR, contact us by completing and submitting the form below. If you are looking for a specif part number, please include it with your message.